Studying Korean proves our scholars can learn anything if they choose to work hard at it, and it makes them unique. Our scholars are among the only African-American and Latino students in the nation learning Korean. Seth Andrew founded Democracy Prep in 2005 to ensure that every single student will work hard, go to college, and change the world. Much of the school design and philosophy is based on his experience teaching English in South Korea. To be a teacher in South Korea is to be one of the most respected members of society. Students and parents address teachers with the honorific title of “seon-saeng-nim,” while in the United States, teachers are simply Mr. or Ms.
Coming out of the Korean War, South Korea was devastated. It suffered from a destroyed infrastructure, extreme poverty, and few natural resources. The country overcame these challenges and become one of the richest nations in the world by embracing an intense work ethic in school and beyond. Challenge & adventure – Studying Korean proves our scholars can learn anything if they choose to work hard at it. Uniqueness – By studying Korean, our scholars stand out. They are some of the only African-American and Latino students in the nation who are learning Korean. Phonetic language – Korean is based on letters and sounds. Unlike other Asian languages like Chinese or Japanese, there are no “characters,” making it possible for scholars to become proficient in just four years. College & beyond – Colleges are especially impressed by our Korean language program. Learning Korean is a valuable and marketable skill. Symbolism & proof-point – As a nation, South Korea grew from poverty to prosperity through an educational model similar to ours at Democracy Prep. Similarly, we strive to provide our citizen-scholars with a second renaissance through public education. Korean language curriculum – All of our high school students at Democracy Prep are required to take four years of Korean Language and the Korean Regents exam. 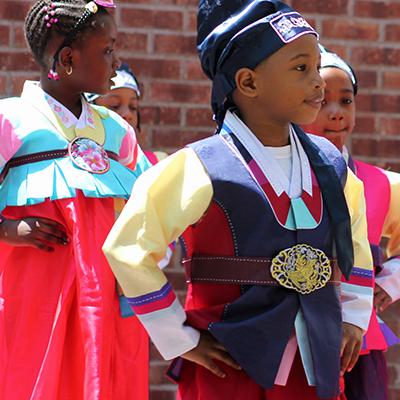 Korean cultural program – Students at all grade levels are exposed to Korean culture through traditional Korean music, mask dance, fan dance and Taekwondo. Study-abroad in Korea – High school students can earn a trip to South Korea. Our inaugural trip took place in November 2012. We have gone every year since. 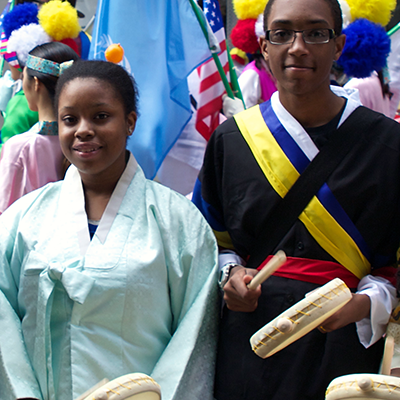 If you would like to get involved or become a donor to help our students continue to study abroad or support our annual celebration of Korean culture, the Korean Street Festival, please email Korean@DemocracyPrep.org or learn more about how to support our programs. Sign up to receive the latest news & announcements.